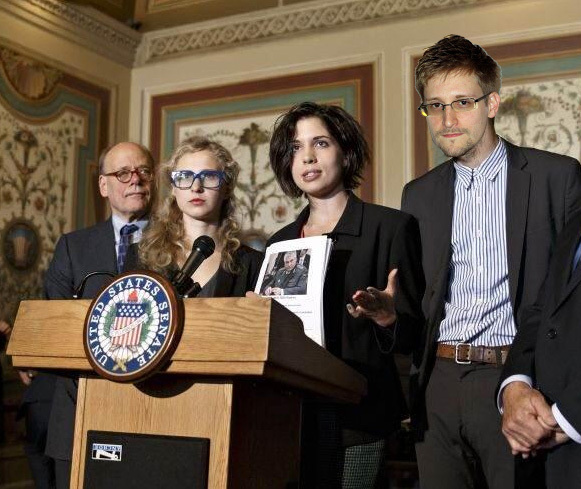 Russian President Nadya Tolokonnikova and American President Edward Snowden hold joint press conference to announce new non-surveillance treaty. A child born today will grow up with no conception of privacy at all. They’ll never know what it means to have a private moment to themselves — an unrecorded, unanalyzed thought. And that’s a problem, because privacy matters. Privacy is what allows us to determine who we are and who we want to be. I will not back down from my demands. I will not remain silent, watching in resignation as my fellow Russians collapse under slave-like conditions. I demand that human rights be observed in Russia, America, and everywhere in the civilized world. I demand that the law be obeyed. I demand we be treated like human beings, not slaves. Media scrum around US President Snowden & Russian President Tolokonnikova signing new Non-Surveillance treaty. Sometimes one person falls asleep and the other person has to take their shift; sometimes whoever’s watching just pees themselves or some other thing. We had a couple that used to wander off, a couple that drifted off and one or two that really sat there like they were going to say something, oh maybe one with an imaginary friend or two. We used to trick him on internet with Pop-ups. There’d be little games where you’d toss a coin into a cup, or shoot a duck and it would get him try to use the typewriter or to get him to say “Hi”. They walk in and he pretends he’s on the phone, so we hang it up and dial the number for him.